Look at me, two posts in a week! I have a yummy one for you today. I made these baked brie bites from Joy the Baker for our New Year's "Ski" party (more on that below). They were so good--buttery & flakey pastry, sweet & tangy cherry preserves, and creamy, rich brie. You can't go wrong. And then add some salty with the sweet with a sprinkle of sea salt to finish...even better. And, they were so easy to make. Took no time at all. I didn't snap a picture of my brie bites, so you'll have to settle for Joy's beautiful picture that is 500x's better than any picture I would post. I also didn't put sticks in mine, but they're pretty cute with them. Cut the pastry into thirds along the creases of the folds. Cut each panel into four pieces. They'll be 2 1/4-inch tall and 3-inches wide. One sheet of puff pastry will yield 12 rectangles. Cut each rectangle in half. 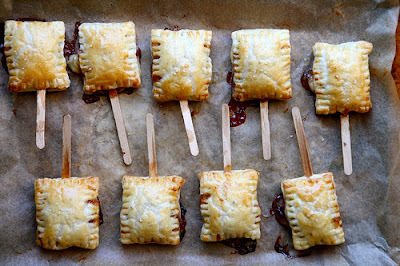 You'll have 24 little rectangles that will create 12 little rectangle pockets for your bites. Combine the beaten egg and splash of milk. Brush 12 of the small rectangles with the egg wash. Place a small sliver of brie (rind and all) on top of the egg wash. Top with about 1/2 teaspoon of jam. Take another square of pastry and press between your fingers to make the rectangle slightly bigger. Place this puff pastry on top of the cheese and jam. Use a fork to press the edges together. The egg wash will act as glue. Make sure to seal the edges well by crimping with the fork. Prick the top lightly with a fork. Place a rack in the center of the oven and preheat oven to 375 degrees. Place prepared brie bites on a parchment lined baking sheet. Brush with egg wash. Sprinkle with a touch of coarsely ground sea salt. Bake for 12 to 14 minutes, or until golden brown. Best served warm, but are also delicious at room temperature. *Don't be afraid of using too much brie & jam...even if it seeps out the edges! I don't think I used enough, but they were still good. Now, the New Year's "Ski" party. Wellll, we all wanted to take another ski trip this winter, but with weddings and other expenses piling up, it just wasn't going to happen for us. 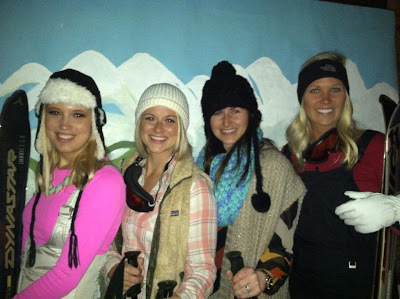 So, we had a ski party right in Charleston, SC. 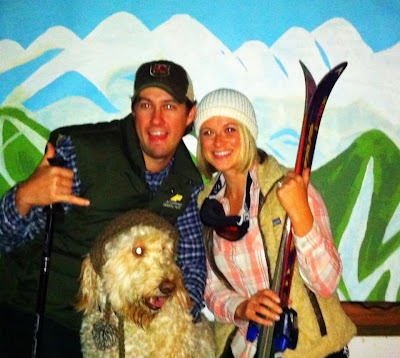 Thanks to Emily and her crafty-self, we had a beautiful ski-scape--the perfect backdrop for photos. It was so fun...and so awesome to be comfortable instead of in a cocktail dress and heels! they're so cute. almost too cute to eat, but yeah right. i love the ski party pics. that's so funny.